Injection molding of thermoplastics allows the plastic material to be melted by heat and then injected under high pressure into a steel mold through an injection molding machine. The thermoplastic injection is used for the manufacture of medium and large series. This process allows the integration of complex shapes, textures etc. 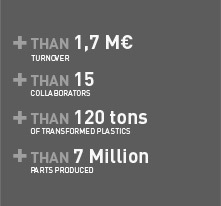 We master the processing of thermoplastics injection since over 60 years and guarantee our partners that we can to respond to their needs in industries such as medical, electronics, building or safety.